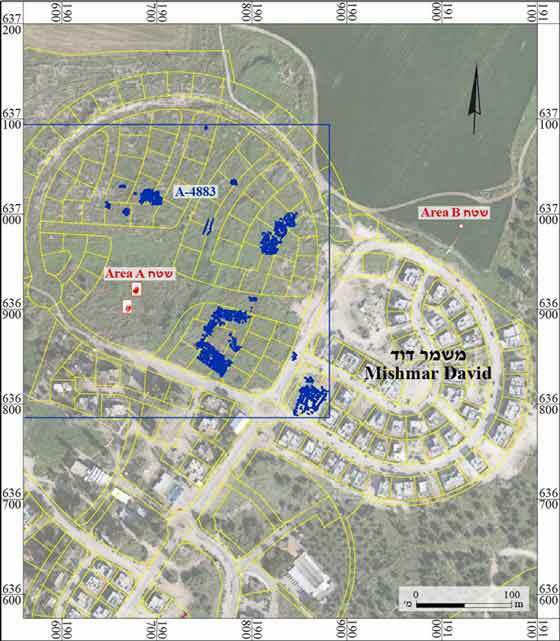 In January 2017, a salvage excavation was conducted in an agricultural area in Kibbutz Mishmar David (Permit No. A-7904; map ref. 190636–1064/636874–7023), prior to construction. The excavation, undertaken on behalf of the Israel Antiquities Authority and financed by A.S.T. Projects Planning and Construction, Ltd., was directed by E.G. 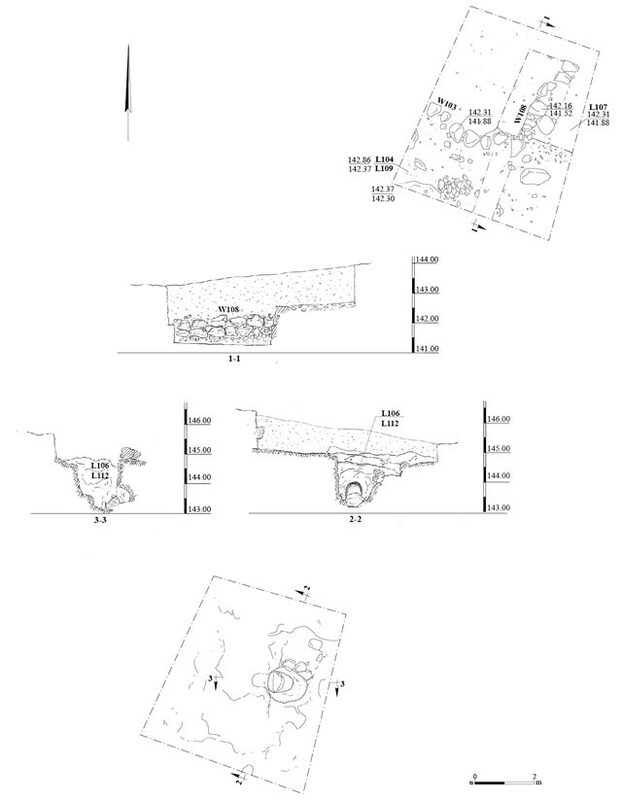 Zwiebel, with the assistance of Y. Amrani (administration), A. Hajian and M. Kahan (surveying and drafting), A. Peretz (field photography), P. Gendelman (pottery consultation and reading), S. Krispin (metal detection), M. Shuiskaya (drawing of finds), C. Amit (studio photography), I. Raznitsky (metallurgical laboratory), T. Winter (glass) and D.T. Ariel (numismatics). The excavation was conducted in two areas (A, B; Fig. 1). 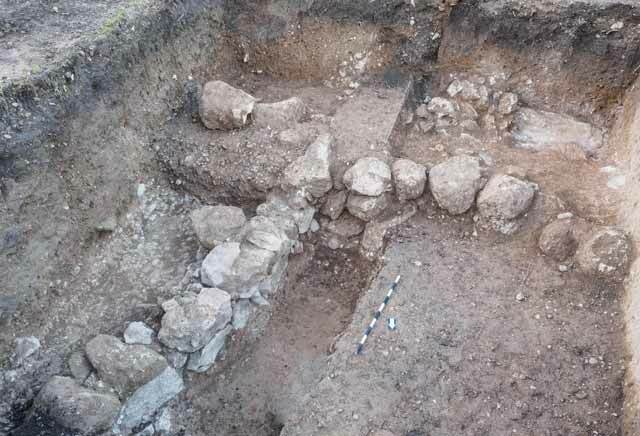 Architectural remains dating from the Byzantine period and a shaft of unknown date were exposed in Area A, and a habitation level with a scattering of pottery sherds on it from the Late Roman, Byzantine and Early Islamic periods was found in Area B. Area A was located adjacent to the Hulda site, where an Early Bronze Age IA settlement and tombs from the Intermediate Bronze Age and Middle Bronze IIB were previously discovered, as well as a large settlement that existed from the Roman period until the Mamluk period (Yannai 2014). The Roman settlement was built on a rocky hill and continued to exist in the Byzantine period and the beginning of the Early Islamic period, at which time most of the hill’s surface was covered with dense construction. The settlement was probably destroyed by an earthquake in 749 CE and was rebuilt during the Fatimid period; some of the structures were renovated in the Mamluk period. Kibbutz Mishmar David was later constructed on the hill. Two squares, c. 20 m apart (Fig. 2), were excavated, yielding architectural remains and a shaft. Architectural Remains. 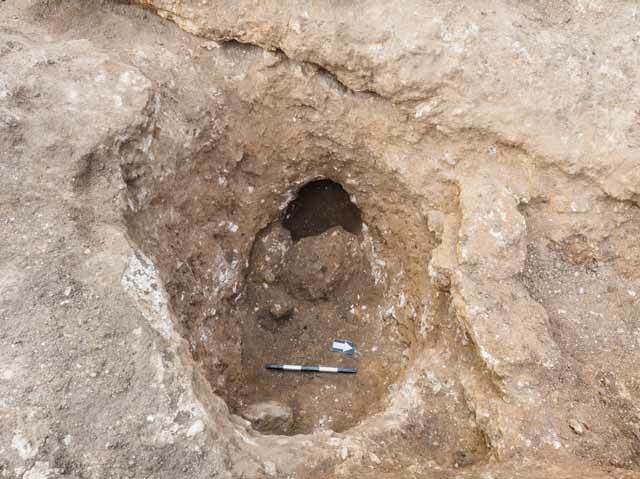 The foundations of two perpendicular walls (W103, W108), probably the corner of a building, were exposed in the northern square, c. 1.5 m below surface. Wall 103 (length 3.5 m, width 0.6 m, height 1 m; Fig. 3) survived to a height of three courses, and W108 (length 3 m, width 0.5 m, height 0.6 m; Fig. 4) was preserved two courses high. It is possible that the walls extended beyond the limits of the excavation. 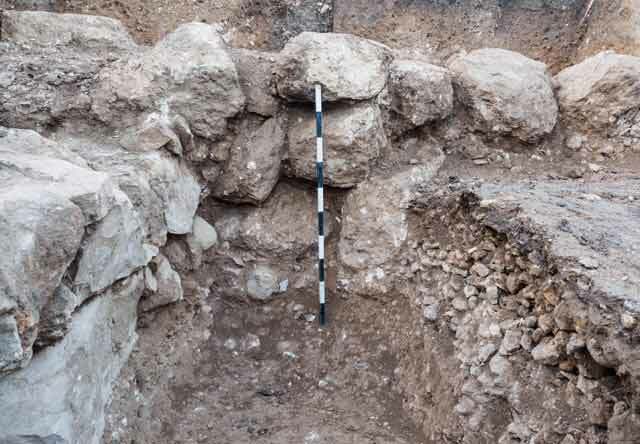 Abutting the walls was a floor bedding (L110, L111; thickness c. 0.4 m; Fig. 5) that contained small stones and pottery sherds, the latest of which are jars that date from the beginning of the Byzantine period (Fig. 6:2, 3). The accumulations excavated outside the structure (L104, L107, L109) yielded sherds, tesserae, animal bones, coins (below), glass fragments (below) and numerous ex situ fragments of tubuli and bricks, which originally belonged to a bathhouse. The earliest ceramic artifacts are ascribed to the Hellenistic period (e.g., a jar; Fig. 6:1). Jars from the Byzantine period (Fig. 6:4, 5) and several sherds from the Early Islamic period (not drawn) were also found. Three bronze coins were discovered: a Hasmonean coin (Jerusalem mint; 134–37 BCE; IAA 154954), a coin of Alexander Jannaeus (Jerusalem mint, 80/79–76 BCE; IAA 154955) and a Late Roman coin (383–395 CE; IAA 154956). Shaft. A shaft (width 1.25 m; Fig. 7) was exposed in the southern square. A niche (0.5 × 0.5 m) that was partly blocked by a boulder was discovered in the western side of the shaft, at a depth of c. 1 m below its opening. No datable finds were discovered in the fill removed from the shaft and the niche. One square was excavated in dark, hard clay. 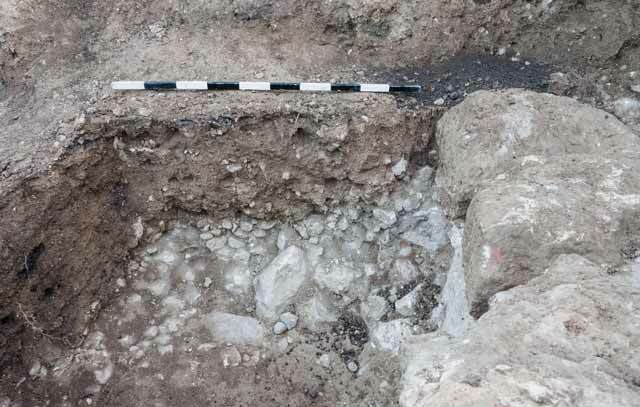 A habitation level was discovered c. 0.5 m below the surface, comprising stones and numerous pottery sherds (not drawn), mostly body fragments from the Late Roman, Byzantine and Early Islamic periods. Some 30 small pieces of glass, mostly body fragments, were found; some are from the modern era. Among the diagnostic fragments are an outfolded rim of a bowl, characteristic of the fourth–seventh centuries CE (from L101, not drawn), and a rim and neck fragment of a bottle, characteristic of the seventh–eighth centuries CE (from L104; Fig. 8:1). 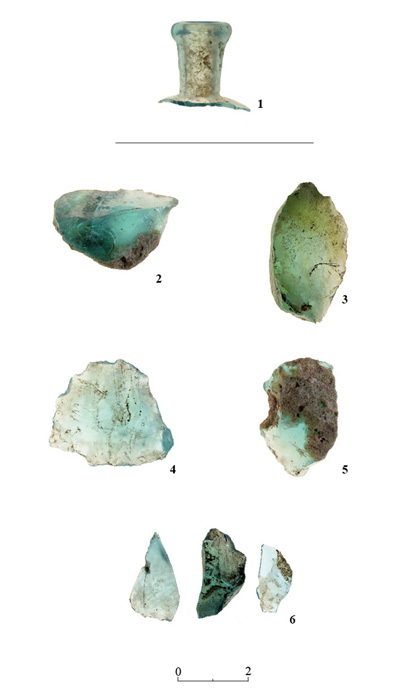 A few small chunks of glass production debris were also identified (from L101, L104, L107, L112; Fig. 8:2–6). The proximity of the excavation area to the Hulda site (Yannai 2014) and the finds—remains of a building, remains of a bathhouse and Byzantine-period potsherds—suggest that the excavation unearthed an additional part of the this site. The bathhouse was not revealed, and therefore it seems that the site was not completely excavated, and that the currently identified site is part of a much larger site. Yannai E. 2014. Mishmar David. HA-ESI 126. 3. Wall 103, looking south. 4. Walls 103 and 108, looking south. 5. The floor bedding, looking north.